Scrutinizer, MRTG, FlowPro, and Replicator. Scrutinizer is a network surveillance platform that allows users to analyze network traffic by collecting thousands of NetFlow and IPFIX metadata elements from the existing infrastructure. Scrutinizer correlates these elements together into a single contextual and actionable database to support rapid incident response. 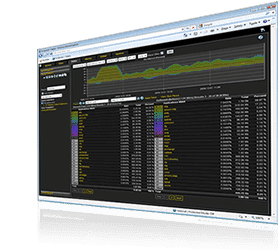 Multi Router Traffic Grapher (MRTG) allows users to gather SNMP data from their network devices to report on traffic load across links. MRTG is written in Perl and works on most UNIX platforms and Windows NT. Administrators can use it to create HTML pages with PNG images for live visualization of the data. Whether you need to monitor traffic in remote offices, in an isolated data closet, or in a data center, FlowPro provides the information you need to perform root-cause analysis of both network performance and security events. Flow Replicator is a User Data Protocol (UDP) forwarder or UDP fanout.� It is deployed transparently, taking in streams of UDP data, duplicating that data and forwarding it to multiple security systems for inspection.� Many routers, servers, and other systems can only send messages to a single log management system. The Flow Replicator overcomes this shortcoming and can transparently pass data to multiple endpoints.